For Palestinian-Bedouins living in the south Hebron hills under the threat of demolition and expulsion, victories are rare. Yet residents from the tin and tarp village of Susiya are uncharacteristically optimistic that they will receive a reprieve from the impending demolition of their village that is scheduled to take place before August 3rd. The tiny hamlet of no more than 350 residents has managed to garner international headlines over the recent week, raising the issue of Israeli demolitions in Area C of the West Bank, the Oslo-delineated section of the occupied Palestinian territory under full Israeli control. In this region building permits are scarce, 98% of requests are rejected according to the Israeli planning rights organization Bimkom. And the consequence for constructing homes without a permit in this area is demolition. Around 500 Israeli activists from left-wing human rights organisations bussed in from Tel Aviv and Jerusalem to march in 100 degree afternoon heat. said Rabbi Arik Ascharom, president of Rabbis from Human rights, an organization that is providing Susiya with legal support. This was Rabbi Ascharom’s second visit to Susiya in the past week. “The first demolition of Susiya was a violation of human rights and the demolition now, that they want to put people out of their house, is just unacceptable. A government that talks about a Jewish state shouldn’t even be thinking about [it],” said Rabbi Idit Lev, another religious leader and activist with Rabbi for Human Rights who carried a banner from the organization. Historically Susiya’s residents lived in stone houses and caves around one mile from their present day village. Their mosque was built atop the foundation of an abandoned sixth century synagogue. The original mosaic tile floor is still intact, but all other parts of the structure were dismantled in 1986 when Israel made an unprecedented expulsion, citing a national interest to construct a tourist bible park because the town sat atop ancient ruins. The state decided preserving the artifacts outweighed the Palestinians’ rights to remain on their land. That area is now called “Sussia,” and is administered by an Israeli settlement of the same name. 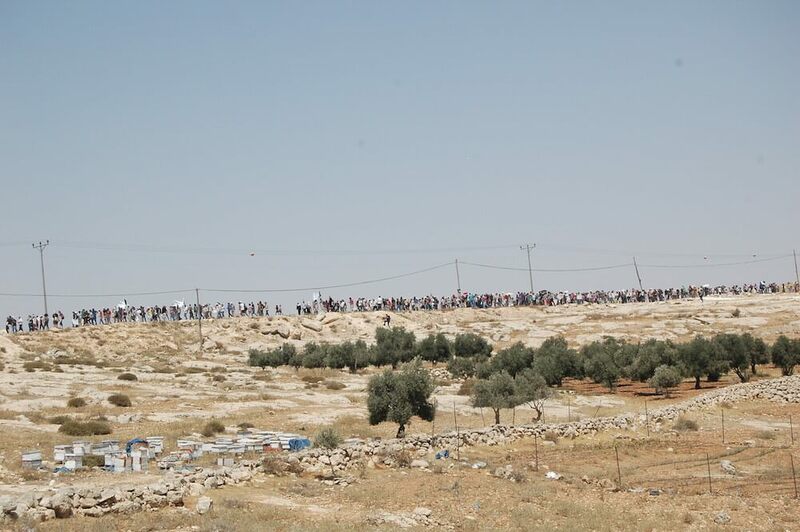 Both Sussias surround Palestinian Susiya. The settlement hopes to expand to where Susiya’s village is today. When Israeli politicians weighed in this week in Knesset, Eli Ben Dahan, Deputy Defense Minister and head of the Civil Administration said, “There has never been an Arab village called Susy[i]a,” reported +972 Magazine‘s Mairav Zonszein. He added the campaign to save the village was a “a ploy by leftist organizations” to aid Palestinians in grabbing land in the West Bank. Dahan’s rhetoric heavily mirrored the Israeli group Regavim that filed a 2012 motion in an Israeli court, which led to the current round of demolition orders. Regavim has produced a series of videos that claim Susiya’s residents are squatters. Yet Susiya’s villagers see the support of Israeli peace groups and foreign governments as a nod that they can pressure Israel into a stay of demolition. If they are unable, they vow to rebuild their town for a third time. said Mohammed Nawaja, 70, as he sat in a protest tent decorated with Palestinian national posters and plenty of small plastic cups of Arabic coffee to offer to the Israeli guests. Tali Shapira contributed translations for this report.